CRAZY COOL GROOVY!!! : I LOVE 2 EAT #210 - TACO PETE: LA's ORIGINAL!!! About this time during last month, Yours Truly CCG had to go into Downtown East Point to handle some business with EAST POINT CUSTOMER CARE!!! After concluding the business, Ya Boy was feeling rather snackish. According to TACO PETE; this very well-known eatery was founded in 1966 by Mr. PETE, and its original location was at the corner of Central Avenue and 41st Street in Los Angeles, CA. Business thrived, his son Pete Jr. eventually joined the business, and together progressively led to opening an additional four locations in the City of Angels. Pete Sr. eventually retired from the business, sold all of his LA Locations, and relocated to to Atlanta. 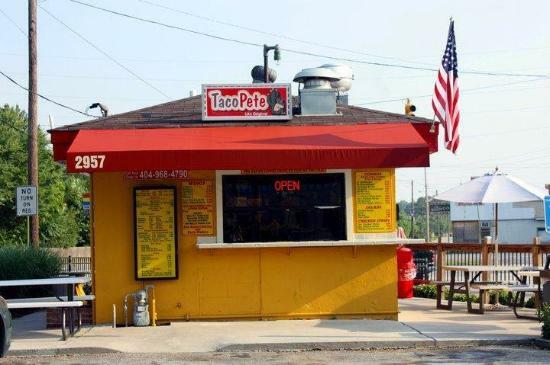 Pete Jr. soon followed suit, relocated to Atlanta, and in 2006 opened TACO PETE: LA's ORIGINAL. 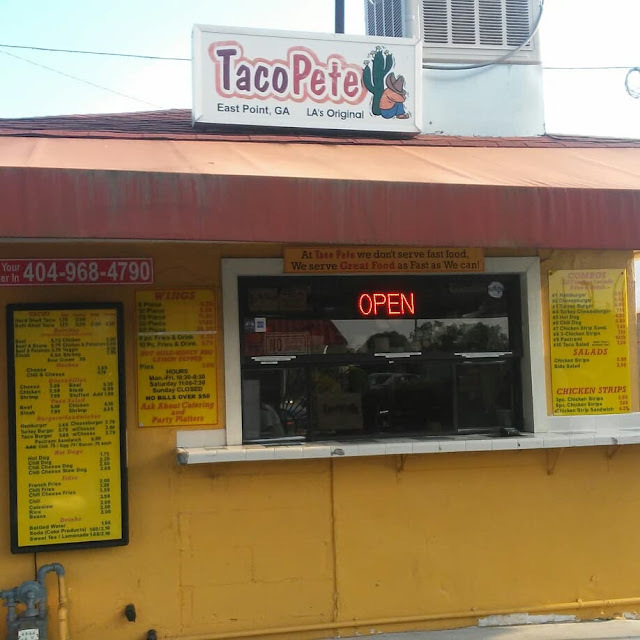 TACO PETE: LA's ORIGINAL stands alone at the very busy intersection of Main Street, Washington Road, and East Point Street in Downtown East Point, GA. It is directly across Main St .from the East Point MARTA Station, directly across Washington Rd. from CVS Pharmacy, and directly across East Point St. from TACO BELL. 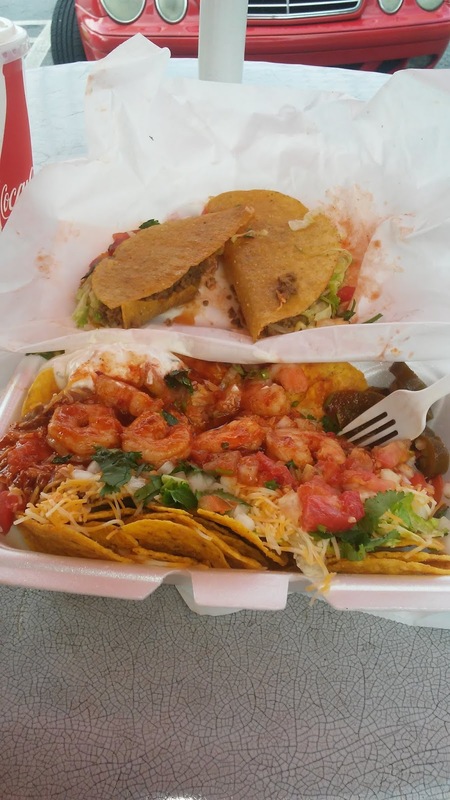 TACO PETE: LA's ORIGINAL - MENU features an array of your favorite MEXICAN delicacies, i.e., tacos burritos, quesadillas, nachos, etc. as well as a generous offering of burgers, dogs, wings, salads, and sides. CCG decided to go wit the SHRIMP TACO SALAD, and upon further inspection of the offerings, decided to add two HARD SHELL BEEF TACOS (photo above). Chased it all down with their fresh-squeezed LEMONADE. The SHRIMP TACO SALAD was a bed of lettuce layered and loaded with their special beans, tomatoes, ground beef, onions, cilantro, and shredded cheese. In the corners were healthy dollops of sour cream, guacamole, jalapeno peppers. the concoction was bordered with a generous helping of round tortilla chips. The Hard Shell Beef Tacos were two warm hard taco shells filled with well-cooked well-seasoned ground beef, lettuce, tomatoes, onions, shredded cheese, cilantro, and drizzled with taco sauce. GOOD FOOD, GOOD LOCATION, GOOD SERVICE, GOOD CONVERSATION, GOOD TIMES!! !